When I first tried Steam’s Backup Tool, I was pretty impressed. The tool allows you to backup your games through a Steam interface, and what it does beyond a simple copy-paste is this: it compresses the game files, but also allows you to split the compressed files so that they can fit on multiple CDs or DVDs. It also allows for backing up multiple games in one shot, housing them all within the same set of CDs or DVDs. 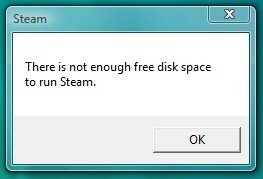 There is not enough free disk space to run Steam. I executed the “steambackup.exe” file straight off the DVD, and got that error right after clicking “Restore Left 4 Dead backup”. Considering I had at least 40 gigs free on my drive, I immediately started to suspect that the Steam Backup Tool was trying to install the files on the DVD, which would never work. To get it working, I had to copy the files from the DVD to my hard drive. When I ran the “steambackup.exe” from there, it actually worked fine – proving my theory. I’m a bit surprised Valve would allow such a bug to exist, especially considering how easy it is to encounter. They could of averted this by simply asking the user which drive to restore the backup to. Update: It seems this only happens when you try to restore the backup on Vista and Windows 7 machines – XP works fine. Thanks to Morph for the tip. Update 2: Better solution is available in the comments section. Take a look at the posts by “Chwynn”. Forum post: There is not enough free disk space to run Steam.